Growing up, our bodies are the first place we learn about desire. We feel moments of wonder, attraction, self-acceptance and amazement by ourselves or with friends, lovers, families, or acquaintances. Yet, just as we find pleasure, we also find limits society places upon our bodies: how and who to desire, notions of what is beautiful and ugly, and how to see bodies – be it our own or those of others. This paradox is in all of our stories as queer people. Some of us faced the stigma and embarrassment of having a period. Others struggle with the sense of misalignment between our bodies and our felt genders. Some of us are considered less ‘able’ than others, are only identified as infirm or sick, or ironically called “positive”. We have all felt unwanted, undesirable and unloved. Our desires have been deemed unnatural and abnormal, and used to ridicule, mock and subject us to violence. Speaking out about the body has historically been a queer and feminist way of resisting this policing of desire. 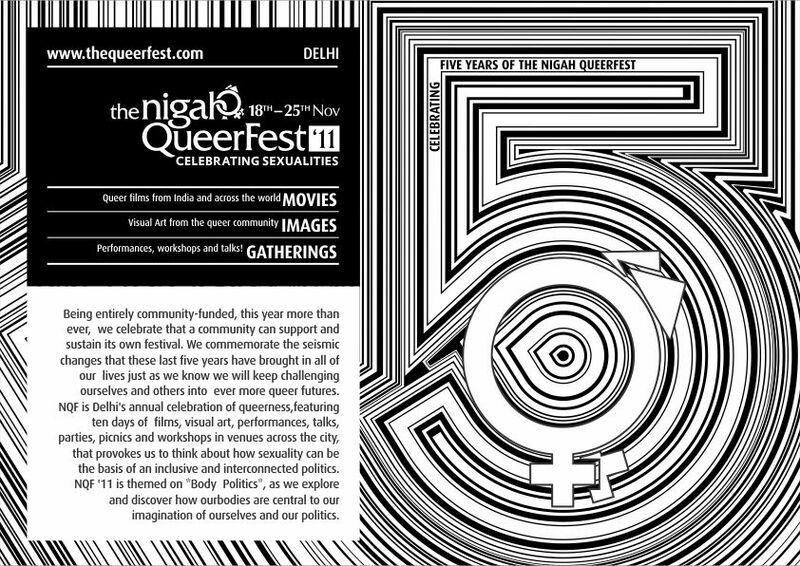 The Nigah QueerFest ’11 asks: How do we think about our bodies in relation to our genders or sexualities? How do we create and challenge ideals and norms around the body? Where do we house pleasure and pain in our bodies? What are the ways in which we can and have pooled together our bodies and used them to transform ourselves into a Body Politic, a political movement that is involved in creating social and cultural change.